With thousand of miles separating Dan Andriano from his other Alkaline Trio members, he has had plenty of time to master his solo craft. Creating the new moniker and slowly releasing demo’s since 2009, Hurricane Season has been a long time coming. A labor of love from his relatively new surroundings in St. Augustine FL. This record is full of what makes Alkaline Trio great with more of an Elvis Costello vibe. 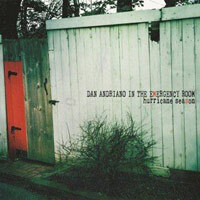 While being based around Dan and an acoustic guitar,Hurricane Season has a tasteful palette of electric guitars, organs, piano, drums, and the occasional bass. In a very personal departure from his norm of the Trio, Andriano paints the picture of a traveling man searching for something he might not be heading towards. Finding little comfort in hotel rooms and late night phone calls, he searches for a cure. Whether that be a partner to share his fear with or a good nights sleep. Dan’s song writing abilities shine through his blackened insides and make for a great batch of songs. This entry was posted on Thursday, July 21st, 2011 at 5:06 am	and tagged with alkaline trio, Dan Adriano, elvis costello, emergency room, hurricane season and posted in News, Reviews. You can follow any responses to this entry through the RSS 2.0 feed.